so glad we are out! Every time I look at television I am asked to save the world, tigers, whales, children, animals, forests and and and. Why on earth are there according to the Government office of National Statistics 164,000 registered charities increasing by 250 every month? Who on earth permits this to happen and why? One reason why I suspect is that ‘Charities’ pay people to run them and the highest pay goes to the executives. Take the RNLI which is apparently the most successful charity in the UK in terms of income. Originally it was formed to rescue the crews of merchant ships when they got into difficulties. Today Merchant ships mainly use commercial or national organisations to assist as happens in most countries of the world. If you get into trouble then you call our commercial tugs, commercial rescue boats and commercial helicopters and pay for them! Today the primary role of the RNLI is a sort of AA/RAC breakdown service for amateur sailors backed up by the coastguard. Despite the fact that the RNLI has the same number of ‘offshore’ lifeboats as it did 20 years ago when the organisation was run with 1 executive and 3 managers it now has a staggering 32 people on salaries of £60,000 to £134,000 a year. If you take out the 16 on salaries of £60-69,999 that still leaves 16 ‘top’ management earning £70-134,000 a year. These 16 almost without exception are retired Admirals and Generals – Jobs for the Boys? The only significant difference in work load from 1990 to today is the introduction of inshore RIBS. How can this need a further 16 retired Admirals and Generals to administer for salaries of between £70-134,000 PA? The answer is that this very successful business for paying retired Admirals and Generals lots of dosh is the main function of the RNLI. Why on earth shouldn’t people ‘boating’ pay a commercial organisation to ‘get them home’? It is easy to lampoon the RNLI because it is so clearly a dodgy charity run to benefit the great and the good but what of the 164,000 other charities? I have a lot of time for the Salvation Army, Battersea Dogs home, RSPCA but many of the others exist, I suspect, to pay good salaries to those that ‘run’ them. I would like to see every charity that begs for my money tell me what it’s executives earn and what proportion of it’s income actually goes to the front line – to people in trouble or need. There is the theory that dinosaurs were wiped out, over a very short period, by an asteroid impacting the earth – causing floods or whatever. Just suppose it was ‘bird flu’ – ‘Ebola’ – dinosaur ‘foot and mouth disease’! We are seeing today that a virus like Ebola can spread throughout the world quite quickly because of air travel and it has reached a critical number and is currently expanding exponentially. 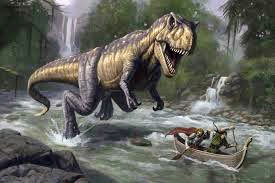 Quite a high proportion of dinosaurs were flying creatures and many of these were carnivores. Given the present experience of rapid infection it is possible to hypothesize that 66 million years ago an ‘Ebola/Foot and Mouth’ virus infected a group of dinosaurs and from there over a very short period spread out over the world. This led to the extinction of most dinosaur groups at the close of the Mesozoic Era. The birds that were carnivores spread the disease by eating corpses or attacking small dinosaurs that in turn were attacked or eaten by bigger dinosaurs. A few vegetarian birds survived – like pelicans etc. I think ‘Ebola’ – dinosaur ‘foot and mouth disease’ is as good a theory, as the impact theory, which has always made me wonder what sorts of gas or floods or climate change would actually wipe out dinosaurs everywhere almost completely in a very short time frame. But just think what that means for society. It will collapse entirely and all sorts of secondary problems will lead over a few generations to the extinction of the human race. The impossible challenge that survivors will face is the collapse of the infrastructure of our civilisation. If we become small groups of survivors then we will have very few skills. Probably totally dependant on hunters – gatherers to provide the daily bread. Except there will be no bread as there will not be any corn being farmed as there will be no fuel for the tractors and no electricity or gas for the ovens. So what will the hunter – gathers do to bring home the bacon? Well at first, they can shoot the pigs, dogs, cats, cows, chickens ducks and geese, dig up root crops, pick berries and nuts which might help a very small group, but imagine if it were a group of 200 or so people – awful lot of shooting and the rounds of ammunition will run out in a few years- except perhaps in the USA, and the crops available will not last long. I suspect that 200 is too big a group to be sustained by hunter – gatherers. Don’t forget the world no longer has petrol, diesel, electricity, gas and even just cooking the food will be a challenge. Somebody will have to collect fuel for cooking and I doubt that anybody wants to run a kitchen to supply food for 200 every day. OK the 200 group will probably split down to smaller units but none the less within a couple of generations they will all become ‘cave people’. Not sure if any research has been done to estimate how many human beings are needed to more or less sustain our civilisation? Think about how many trades there are and how many artisanal skills must be retained. Just take fossil fuel extraction for our planes and cars. Firstly the ‘rigs’ are constructed from iron. Therefore you need people with the skills to find the stuff and miners to get it out of the ground and smelters to extract metal from the ore and then blacksmiths to make tools in forges to make steel girders to and to rivet or weld them together you need… It is endless. My suspicion is that a million people all co-operating fully would not be able to maintain our civilisation. And if you had a million survivors all in one place then what percentage would need to be hunter gatherers and how on earth would you feed and water such a large community? Is there going to be all the artisanal trades, technical trades, medical trades, constructional trades and most importantly manufacturing skills represented in a cross section of surviving society? My bet is that amongst the 30% survivors of Ebola there will be very few capable of keeping it all running. For and for the first generation it will be a matter of using what is laying around but the next generation will find the stock of ‘useful’ things has run out. All this is not attractive not to mention the worlds land surface covered in rotting corpses feeding carnivores, bats and birds who, chomping away, infecting back to the animal world and their own extinction. I suspect this vicious circle could go on for years and most of the earth would be a pretty dangerous place to live on. This is not to say I don’t want to survive. Of course I do. When I first thought about how to ensure being around next year if it all goes pear shaped and the disease is rife I immediately thought about my nice sailing boat and knowing how to fish. Get down to the boat and cast off… Fishing would probably produce enough food to live on but ultimately it would be lack of water that would do for us. It would not be smart to go ashore into the mayhem and connect up a hose pipe even if there was pressure as ‘death’ would certainly have got into the system. The old fashioned way of going ashore with containers and filling up from streams, rivers and lakes also seems very risky and anyway a small sailing boat cannot carry that much water on deck winter and summer for several years. Install a water-maker in the boat right now… The problem with that is it needs considerable amounts of energy to function and my previous experience of owning one in the tropics is that solar panels and wind generators do not produce enough electricity. The best water-makers are connected to the engine and ‘manufacture’ fresh water every time the engine runs. But the problem with that of course is that a sailing boat only carries very limited amounts of fuel. A large motorboat would carry much more fuel but none the less it would still be necessary to visit land frequently to replenish the tanks. And of course that is the survival problem. How to keep going for at least a decade without having to visit land too frequently. Big ships – merchant vessels, cruise liners have vast resources of refrigeration, fuel oil and accommodation but they could never keep running for more than a year or so but a tanker, a tanker carrying refined diesel could go on until its plates rusted away. It has water-makers and accommodation. It will come with some food stuffs for its crew of 20 or so and is capable of surviving the worst weather conditions either underway or on anchorage. The cargo of fuel oil would keep the ship going forever… Just a matter of finding one and then learning how to operate it.